I am looking for a flatmate who's chill to share a bright, clean, quiet, spacious and newly renovated HDB apartment. The apartment is fully furnished: the kitchen is equipped with an oven, a microwave oven, induction hob, pots and pans etc; a backyard with a washing machine and dryer; the dining table is large enough to seat 6 to 8; the living room has a couch and and high speed fibre wifi (1gps). The room being let is also furnished, with a super single sized bed, a writing table and chair. There is a new air-conditioning system daikin smile series installed and there is also a retro standing fan for those of us not partial to the dry air from the air-con. 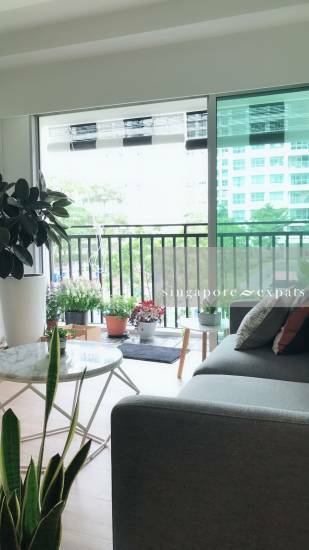 The apartment is located 5 minutes walk from Punggol MRT and thus also only minutes away from Waterway Point and you will also find a wide range of cool chic cafes and eateries in the Punggol area. Punggol MRT is just 20 minutes train ride to Dhoby Ghaut MRT. Punggol Safra/Sengkang General Hospital/Sengkang Polyclinic is about 10-15mins vicinity. The apartment block is situated away from the main road, so it’s generally quiet and less dusty and you enjoy lots of fresh air and the beautiful garden view right in front of your 3/4 level window. There is a exercise area infront of the apartment where you can enjoy the evening working out after a good jog. At present, I (the owner) live in the apartment. I am a busy working professional but can try to hang out for a meal every now and then. Ideally, I am looking for a working flatmate who is considerate, respects personal space, generally clean and tidy to join my little household. Rent is slight negotiable, but I’m thinking $800 per month which would include use of air con, electricity, water, wifi, washing machine and dryer usage, we can all save some time on housekeeping. Light use of Fridge space for cold storage and light cooking is allowed. No hidden fees. Rental include all utilities. One friendly singaporean chinese owner staying and no other tenants or housemates. Prefer 2 year lease term. However, shorter terms can be considered. Agents with quality tenants welcomed.